Story View gives you a big-picture view of all the content in your course. 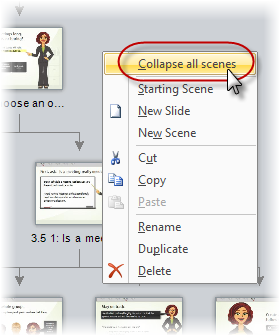 In this view, you can view and arrange your slides in groups, called Scenes. The starting scene (which is what learners see when they first launch your course) has a small green flag next to its title, and it'll always be the leftmost scene in Story View. Lines and arrows indicate the relationship between slides and scenes. If you're building a non-linear course, you can use triggers to customize how users proceed through your course's slides and scenes. 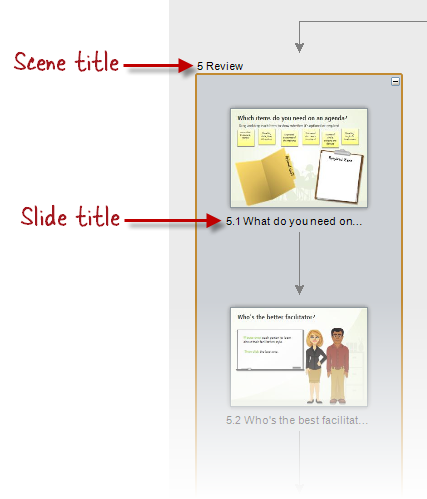 To change which scene the learner sees first when your course launches, select the scene in Story View and click Set as Starting Scene on the Home tab. (Or, right-click the scene and choose Starting Scene.) 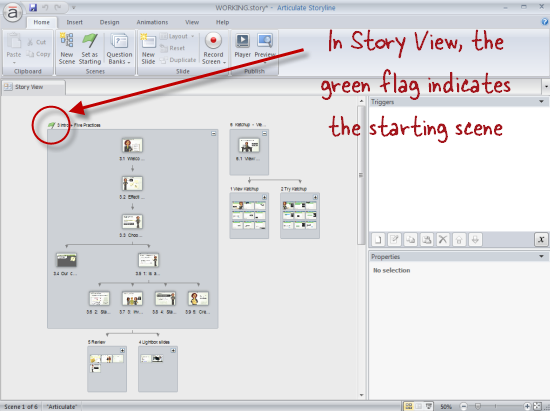 The starting scene is marked with a green flag and appears in the leftmost part of the Story View workspace. To add a new scene in Story View, click the Home tab and choose New Scene. 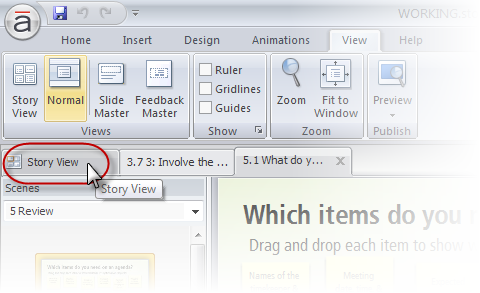 Or, right-click anywhere in the Story View workspace and choose New Scene. The new scene will contain a single blank slide. You can double-click the slide to switch to Normal View, where you can add content to the slide. Another way to add new scenes is to create a duplicate of an existing scene. Just right-click a scene and choose Duplicate. To add a new slide, you can click New Slide on either the Insert tab or the Home tab. You can also right-click in the Story View work space and choose New Slide. The Insert Slides window appears, where you'll have several choices for the kind of slide you want to insert. If you need help choosing from the options available, check out the tutorials here. Each scene and slide has a title. Scene titles appear at the top of the scene. Slide titles appear below each slide. The slide title you see below each slide will be what Storyline uses as the default text in your course's menu, if you choose to include a menu in your player. But you can change the wording on your player menu, if you like, without affecting the title text that appears for each slide and scene here in Story View. 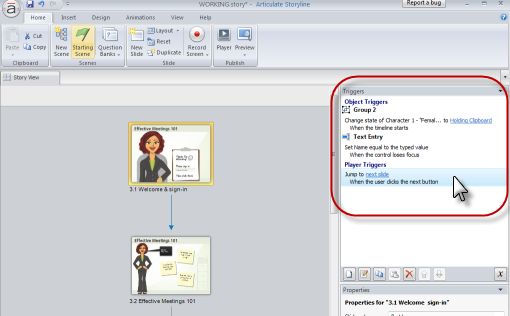 Check out the tutorials on Customizing the Storyline Player for more details. For scene titles, Storyline inserts "Untitled Scene" as the default name at the top of each scene. You can double-click the scene title to change it, or right-click the scene name and choose Rename. The scene titles will be what Storyline uses as the default text in your course's menu, if you choose to include a menu on your player — but you can change the wording on your player menu, if you like, without affecting the title text that appears here in Story View. Check out the tutorials on customizing your player for more details. To rearrange slides, just click and drag a slide to the place you want it to be. 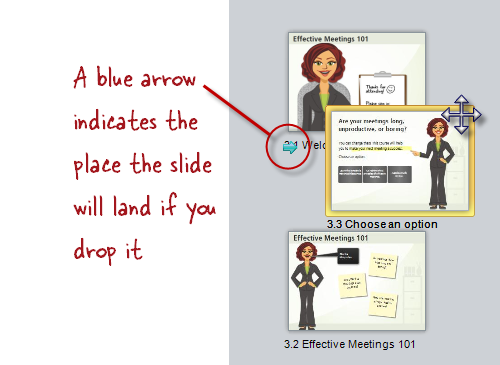 When you drag a slide to a different place, a small blue arrow will appear to show where it'll be inserted. Release your mouse button to drop the slide into place. You can even use Shift-Click or Ctrl-Click to select multiple slides at the same time, and move them as a group. You can move slides within the same scene or into different scenes. Sometimes it's helpful to collapse a scene in order to get a better view of what's in your course. You can click the minus sign in the upper-right of any scene to collapse it. Click the plus sign to expand it again. You can also collapse or expand all your scenes at the same time by right-clicking in the Story View workspace and choosing Collapse all scenes or Expand all scenes. By default, slides and scenes follow a linear order, but you can create non-linear learning paths by changing the triggers on any slide. Just select a slide and, in the Triggers panel, edit the trigger for the Next button (or any other trigger on the slide). Need a quick overview of triggers and how they work? Find out here. Fit to window: To the right of the zoom slider in the lower-right corner of your screen, you'll see a small rectangular button with arrows. Click that to make everything fit in the viewable area of your Storyline window. Or, click the View tab and select Fit to Window . Switch a slide's layout: You can right-click any slide and choose Layout to assign a different master layout to that slide. Or, with one or more slides selected, click the Layout option on the Home tab and choose from the slide layouts available. You can also choose Reset Slide if you've modified some of the layout elements on the slide and want to revert back to the master layout's original properties. Need help customizing slide layouts? Find out more here. Change a slide's background: Right-click a slide and choose Format Background to add a different fill to the slide's background. Or, click the Design tab and right-click one of the Background Styles to apply a new background to the selected slide or all slides. If you need some guidance on using the Format Background options, check out the tutorial here. Switch to a different design theme: Design themes allow you to quickly change the background, colors, and fonts used on a specific slide or on all slides in your course. You can use the Design tab to switch to a different theme, or modify the theme colors or theme fonts. Here's a tutorial with more details about design themes. 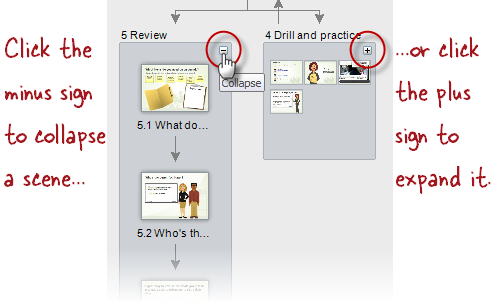 Change a slide's transition: Select a slide and click the Animations tab to choose a different transition for that slide. More on transitions here. Add or edit triggers: Triggers tell Storyline how to respond when learners interact with your course. Select a slide and use the Triggers panel to add, edit, or delete triggers. Find out more about using triggers here. Change slide properties: You can adjust the properties of any slide by selecting the slide and using the Properties panel. You can change the slide-advance behavior, the player controls available on that slide, and more. If you use Shift+Click or Ctrl+Click to select multiple slides in Story View, you can even change the properties for all selected slides at once. For help with choosing the slide properties, check out the tutorial here. Duplicate, rename, or delete slides: To duplicate a slide, select it and click the Duplicate option on the Home tab. Or, right-click any slide and choose Duplicate. You can also use the right-click menu to Rename or Delete a slide. You can click the Record Screen button on the Home or Insert tab to create a movie or interactive screencast to insert in your course. If you've already created a screen recording in this project, you can click the small arrow on the Record Screen button and select from a list of screencasts available for inserting. For more information on screen recordings, see this tutorial. The Question Bank button on Story View's Home tab allows you to insert quiz slides from a bank of questions, or to manage your question banks. 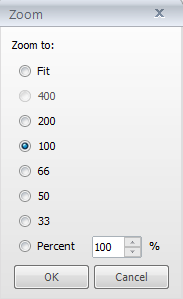 When you click Question Bank, you'll be able to choose from several options. For more details on setting up and using question banks, see this tutorial. Keep in mind, you don't have to use question banks to insert quiz slides — if you prefer, you can add quiz questions one at a time to your course. For help with that, check out the tutorials called Adding Graded Questions and Survey Questions, and Adding Freeform Quiz Questions.